If you’re looking for the best smart trike for your kids you are in the right place because we’ve done all the hard work to figure out the only stroller tricycles you should consider buying! ✅ This specific smart trike is the most popular with our readers. It’s a brilliant smart trike and you’ll also find that it’s one of the cheapest smart trikes available online. Which Smart Trike is Best? There are so many different smart trikes to choose from that it was tough to narrow it down, but when it comes to the trikes with the best reviews there are 6 best smart trikes to choose from. They’re all brilliant trikes and very affordable. The folks at Amazon also have their own list of the best smart trikes – and many are on sale. These are all great trikes and to be honest you and your child should be happy with any of the. Buying tip: watch that page above for the Radio Flyer and if you see it for under $100 grab one because it’s a GREAT deal! Looking for the best smart trike? If we only had to pick ONE trike we would agree with the results below. ✅ Amazon has selected this trike as their “Amazon’s Choice” 2018 Winner. The price is great and it’s available on Prime so you can get free shipping, and get it FAST. It’s suitable for children from 9 months old right through to five years old. It has an adjustable 3 point harness to keep them safe when they’re under two. The seat can be adjusted forwards or backwards to make sure they can reach the peddles. It’s easy to steer and feels just like pushing a stroller. The sunshade keeps your little one out of the sun. Unlike most other trikes to wheels are made of rubber instead of plastic. The safety tray has a hole for a drinking cup and grooves that are perfect for holding snacks. The handle is made of steel and will not break off. The only real downsides to this smart trike is the time it takes to assemble (which is actually common among trikes) and the fact that it can squeak a little over time (which is nothing a squirt of oil won’t solve). Now we’ve revealed the BEST smart trike according to Amazon and over 1,000 satisfied parents, let’s take a look at the best tricycle strollers according to the reviews and ratings. Now let’s take a closer look at each of the best rated trikes this year and the features that make them stand out from the crowd. My kids were proud peddlers of a pair of smarTrike Zoo 3-in-1 trikes which are no longer available as they have been replaced by the Glow and Dazzle models mentioned above. I thought it would still be useful to share our experiences though to help you decide which smart trike to buy for your child. How easy is it to assemble the Smart-Trike? The website talks about a ‘1 minute Click assembly’ but I wonder if that relates to the more expensive models because it took my poor hubby nearly two hours to put the two trikes together! This product is sold worldwide so the instructions are pictorial and took some deciphering. In most places it goes together quite easily, but there were a couple of things, like the screw that holds the seat to the axis, that had to be lined up at a perfect angle or you couldn’t thread the screw. It’s also not entirely clear from the pictures that the crotch buckle for the three-point harness is different to the one used on the lap belt. Hubby just grabbed the first one that came to hand, and then had to take most of the trike apart to swap the buckles when he realised he’d installed the wrong one! Of course it didn’t help that the kids were so excited to ride their new trikes that our son was trying to get on his before it was even assembled. When I removed the children from the room assembly became a lot easier! If you’re going to buy a smart trike for your child as a gift I would recommend assembling it before you give it to them so they can ride it straight away. My little ones were 15 months old when we first started using smart trikes so according to the instructions they could have started out at phase 2, with just the lap belt, but our little girl can be temperamental at times so we decided to start out with the three-point harness to give her less chance of escaping the trike when she’d had enough! How easy is it to push a smarTrike? Pushing and steering was easier than I thought it would be, it’s a different experience from pushing a stroller though (especially a double one) as this is much lighter and at first I thought I might over steer and end up in the road. The parent handle bar moves up an down so you can adjust the height. You’ll need this to adjust the height depending on how tall or short you are, but also to make it easier to store. My only complaint is it doesn’t come up quite far enough to push comfortably. My hubby is just over 6ft, and I’m 5ft6 and even for me it was a little too low. We pushed the kids to the park and back which is probably about a 25 minute round tip with a break in the middle, and I certainly wouldn’t want to take it on a journey any longer than that as it started to take a toll on our backs. Did the kids enjoying riding the Smart-Trike? My two are not fans of the stroller. They’ll tolerate it for a short time but then they want to get out, and I think it’s because they can’t see very much when they’re sitting in it. By comparison they loved riding on their trikes. Neither of them could reach the pedals (not even our son who is 95 percentile for his height), but there’s a little bar for them to rest their feet on and they can ‘steer’ using the handle bars. Oh and there’s a little phone attached to the handle bars too which they like playing with on the journey. They also have full 360 degree visibility, and our daughter spent most of her time in the trike pointing at things we pass, which is perfect for developing social and communication skills as we can talk about the things she is pointing at. Can it handle all terrains? We put it to the test on sidewalks, roads, gravel and grass and it seemed to cope well on all of those surfaces. The wheels on our trikes are hard plastic so riding on hard surfaces throws off a few vibrations which started to bother me after a while, although the kids didn’t seem to mind too much. Is a smart trike easy to store? Unlike a stroller a smart trike doesn’t fold up, and even though the smarTrike has a telescopic handle it still takes up a lot of room. With the parent handle attached this trike takes up a lot of room, more than a stroller which can be folded down. If you want to take it in the car to use away from home you’ll need to have an SUV or MPV or you’ll struggle to fit it in. Make sure you have somewhere to store a trike before you buy one. We all know how expensive kid stuff can be and how annoying it is when they grow out of things so quickly. And that’s whats so great about smart trikes, they actually adapt to your growing child. You start out with the stage 1 set up which is perfect for babies of around 10 months upwards. As long as they can sit up unaided then they’ll be able to ride in their trike. There’s a comfortable and supportive seat that doctors say supports their posture better than a traditional stroller, and a three-point safety harness, to keep them from falling out! Of course your baby will be too little to reach the pedals at this stage, let alone pedal the trike themselves, so you attach a steering handle to the back which allows you to ‘drive’ the trike by controlling the steering mechanism on the front wheel. Some trikes have a sun visor and carry pouch attached to the steering handle for storing snacks or a spare diaper. At around 15 to 18 months (according to your own child’s development), you can remove the padded seat back and three-point harness so that your child can ride on the actual tricycle seat with just a lap belt. If your child is tall enough to reach the pedals by this age they can ride the trike themselves, though you are still in control via the steering handle. 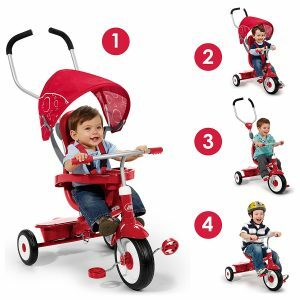 Somewhere between their second and third birthday you move to official trike mode by removing the steering handle and letting your child loose all by themselves! Still undecided? Smart Trikes make Amazon’s list of top ride on toys – but they have lots of other fun looking rides on it too! Check it out here! We had a SmarTrike for our son and he loved it. He would use the trike long after he stopped using the pushchair which was so useful on longer walks. Ours has just been passed on and I was very sorry to see it go. Hi Pippa – that’s good to hear, I’m pretty sure our kids will be the same! So true – though I think I’d rather take the pushchair when we go shopping as you certainly couldn’t hang your shopping bags off these handlebars! We never had anything like this for Ben and Chloe – might have to look at getting one for Amy when she’s bigger! Definitely worth it – especially if you can find a good bargain! My kids don’t really like going out in their double buggy anymore – I think it’s because they have their afternoon nap in it – which they take with no issue – but I assume they think whenever I put them in it at other times that they have to go to sleep so they rebel! Ooh yes definitely look at getting one – the kids love them! These look like a really fun trike! I know a few little kids that would love one! Hey Jill – they certainly are fun, we’ve seen a few more while we’ve been out and about and the kids always look happy and engaged with the surroundings.